The path of utmost happiness. 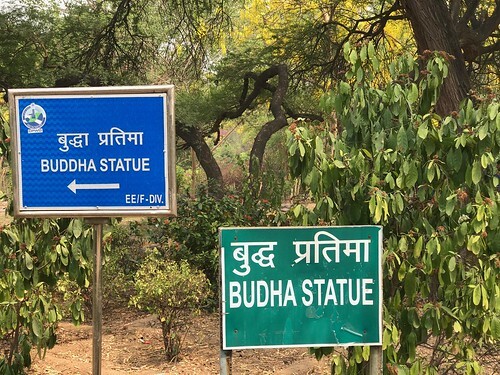 All pathways, it seems, lead to Buddha. 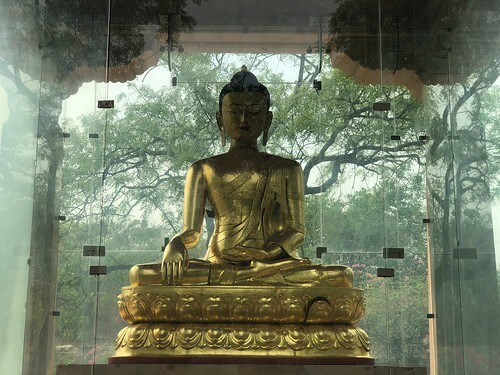 Which is a trifle ironic, since Buddha once suggested there is no path to happiness. 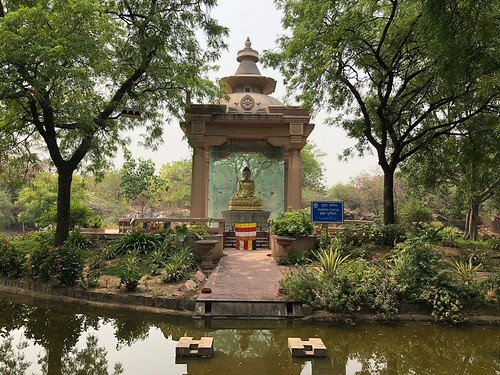 “Happiness is the way,” he declared, and this understanding makes sense while wending one’s own way to the great statue — so serene — at the Buddha Jayanti Park. It is so beautiful here that even a steamy afternoon feels hospitable. 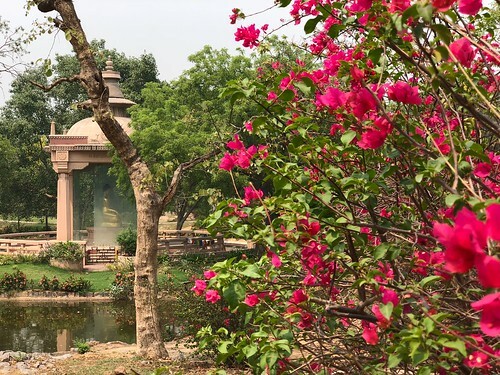 These lush gardens in central Delhi are a joy unto themselves. 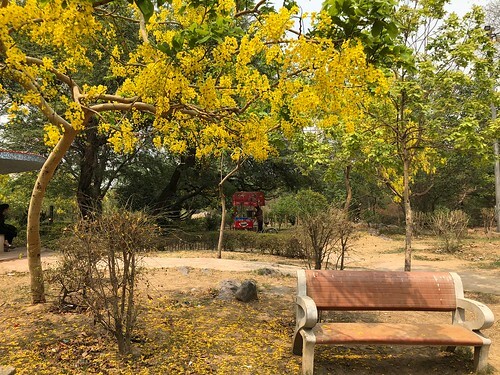 Tucked within a wild ridge, the park becomes the perfect refuge for all sorts of romantic couples sheltered behind every rock and tree, far from prying eyes, far from crowded neighbourhoods. 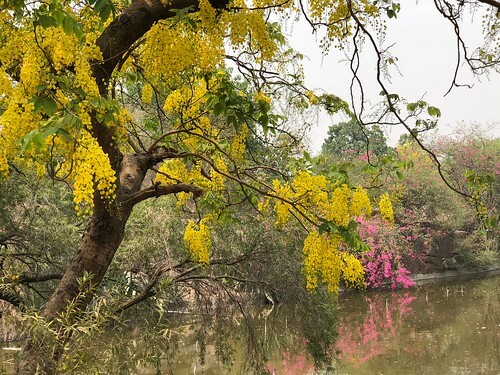 And just because these lovers are hidden from instant view you get the sense that these flowery gardens, commanded by blooming Amaltas trees are, well, almost devoid of humankind. 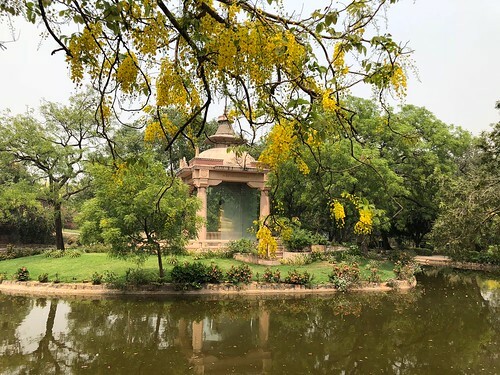 This afternoon The Delhi Walla spots only one solitary person — a young woman in a salwar-kameez sleeping on the grass, her face covered with a blue dupatta. Further along, two gardeners are hurling stones at a mango tree to dislodge the fruit. 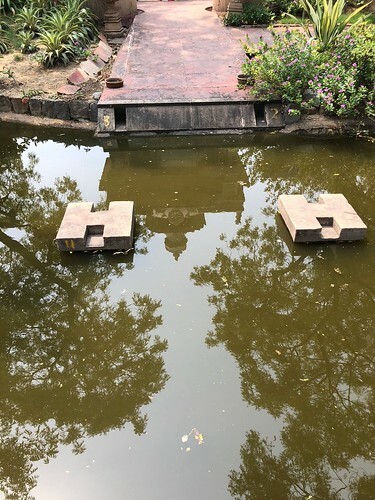 And here’s the Buddha sitting atop a small island in the centre of a pond enclosed in a giant glass case, as if care has been taken that neither the birds nor the Delhi smog can intrude into his meditation. The world seems in utmost peace. A few white ducks are padding about in a corner. Tibetan flags are fluttering along the metal handrail. A rock is inscribed with the words of Dalai Lama, dated 1993. 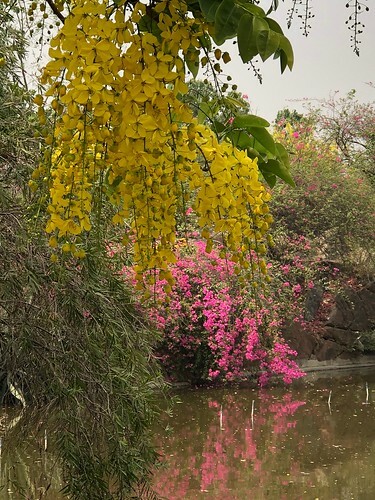 The pond is flanked by both amaltas and bougainvilleas, their yellow and pink reflection in the water giving the illusion of a Monet canvass. 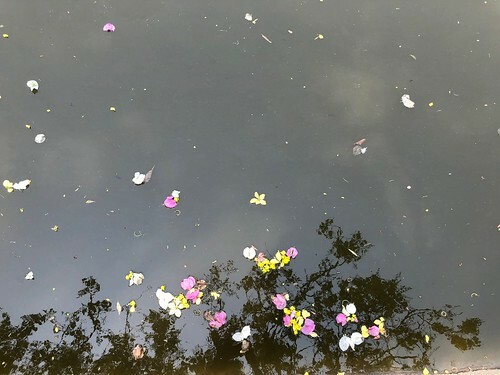 And yet, Buddha remains composed, immersed in his own inner self — not an easy thing for mortals like us when confronted with such heart-stirring beauty.